We maintain Dentistsnearby & it's servers by our own expenses. If you think you would like to contribute by donating to our cause of providing an up to date directory Free. Dentistsnearby.com ("Dentistsnearby.com", "we" or "us") respects and protects your right to privacy in relation to your interactions with this website. We have adopted the following policies to safeguard your personal information and to protect its confidentiality. Any information which is provided by you to Dentistsnearby.com via this website or otherwise will be treated in accordance with the terms of the Personal Data Protection Act 2010 (the "Acts") and/or such amending or replacement legislation as may be adopted in Malaysia from time to time. You should read this Privacy Statement carefully before using this website. If you do not read or if you disagree with any aspect of the Privacy Statement, you should not use this website. Your use of this website signifies your agreement to be bound by the terms of this Privacy Statement. If you are aged 18 or under, you should not use this website nor should you provide any personal information to us via the website. 1. Users contacting dentists via our Website: If you are a user seeking consultation with a dentist or other parties listed on the website Dentistsnearby.com (a "Provider"), then you will be asked to provide certain personal information to us so that Providers who are registered with us can decide if they wish to offer dental services to you. Such information will include, without limitation, details such as your name, address, contact details (including email and telephone number) . 2. Dental Clinics: If you are a Dentist (or a representative of a Dental clinic) who wishes to use Dentistsnearby.com's online service, then you will be asked to submit personal information as part of our registration process, for example, name, email address, phone number etc. This personal information will be used to facilitate dental consultations with prospective patients. You explicitly consent to the disclosure of all necessary personal information to prospective patients. Other than this authorised disclosure, Dentistsnearby.com will not release any personal information to any third parties without your prior consent except for the purposes of validating information or unless we reasonably believe that we are required to do so by operation of law. Dentistsnearby.com retains the right at all times to contact you in relation to the services provided on this website. If at any time after giving us this information you decide that you no longer wish us to hold or use this information, or in the case that the information becomes out of date, you are free to notify us, and we will endeavour to remove or rectify the information promptly. We do not collect or keep your personal data unless it is necessary for the purposes(s) set out above nor do we keep your personal data for longer than is necessary. Dentistsnearby.com reserves the right to transfer information (including any personal information you provide) to a third party in the event of a sale, merger, liquidation, receivership or transfer of all or substantially all of the assets of Dentistsnearby.com , a subsidiary or line of business associated with Dentistsnearby.com. You should also be aware that where you link to another website from this website, that Dentistsnearby.com has no control over that other website. Accordingly, Dentistsnearby.com cannot guarantee that the controller of that website will respect your privacy in the same manner as Dentistsnearby.com. You have the right to request a copy of the information which we hold about you (for which we may charge you a small fee) and to have inaccuracies in your information corrected. Except as otherwise set out in this Privacy Statement this policy only addresses the use and disclosure of information that Dentistsnearby.com collects from you. We cannot guarantee and accept no liability in the event that a Provider (if you are a consumer) or any other third party gives your personal data to third parties or in any way impinges upon your data protection or privacy rights. Due to the nature of the internet, we cannot guarantee the protection of your personal data and therefore we are not responsible for any loss or damage resulting to you when the website is used. You should be aware that each time you visit a website, two general levels of information about your visit can be retained. The first level comprises statistical and other analytical information collected on an aggregate and non-individual specific basis of all browsers who visit the website and the second is information which is personal or particular to a specific visitor who knowingly chooses to provide that information. 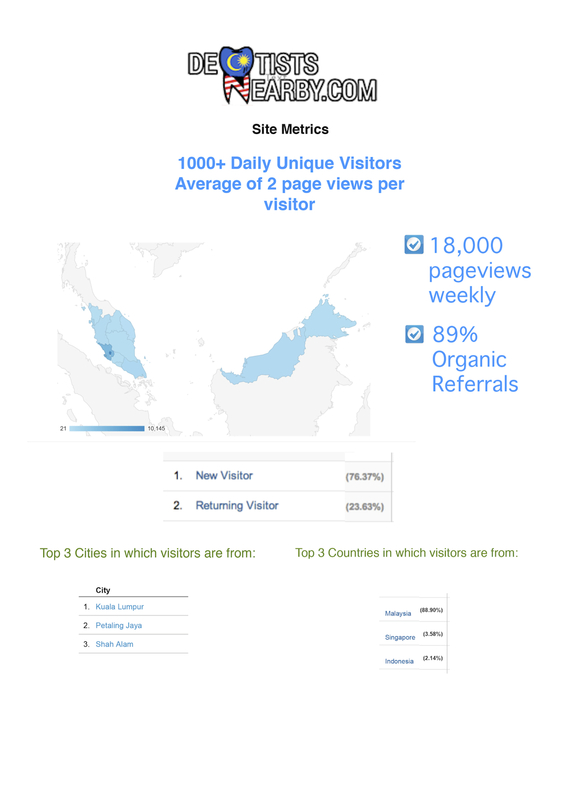 The statistical and analytical information provides us with a general and non-individual specific information about the number of people who visit this website; the number of people who return to the website; the pages that they visit; and where they were before they came to the website and the page in the website at which they exited. This information helps us monitor traffic on a website so that we can manage the website's capacity and efficiency. This type of non-personal information and data can be collected through the standard operation for internet servers and logs as well as "cookies" and other technical mechanisms. Thanks for submitting your company's information to be listed on Dentistsnearby.com, your submission will be attended to shortly. Please check your email soon! dentistsnearby.com is not involved in the provision of any healthcare or Medical/Dental advice or diagnosis. All information provided on the website is intended as a guide only and should not be construed as a substitute for professional dental/medical advice. The website is an information service that displays information on dental clinics that has been gathered from the dental clinics or the internet. We do not screen or validate any content posted by dental clinics, nor do we endorse any particular dental clinic. If you decide to engage a dental care provider to provide dental services to you, you do so at your own risk. You should be aware that the results of any search you perform on Dentistsnearby.com for dentists should not be construed as endorsement by dentistsnearby.com of any particular Healthcare Provider or constituting any comparative ranking of Healthcare Providers. dentistsnearby.com is not a Medical/Dental referral service and does not endorse, recommend, or approve any dental care Provider listed in the Website. We are not Medical/dental professionals nor do we hold ourselves out to be medical/dental professionals and will not discuss or advise on any issues relating to dental treatment with Clients or Healthcare Providers. dentistsnearby.com is not involved in any transaction between you and Healthcare Providers who use this Website. We cannot assure that all transactions will be completed nor do we guarantee the ability or intent of Healthcare Providers to fulfil their obligations in any transactions. As we cannot control the information provided by dentists or information sourced by dentistsnearby.com from the Internet that is made available through this Website, dentistsnearby.com does not guarantee or endorse the authenticity, quality, safety or legality of any Healthcare Provider or the services provided or purported to be provided by the Healthcare Providers, the accuracy of any listings or Healthcare Provider data we may provide to you, or the ability of Healthcare Providers to complete a transaction. dentistsnearby.com gathers information from various Healthcare Providers about their facilities and services as well as from a large number of publicly available websites. You can access this information via our Website. This information should assist you in making a decision on choosing your preferred Healthcare provider by conducting your own research into such Healthcare Providers. A "Verified" clinic simply means we have checked the information of the clinic either by the clinic's own input by submitting a form through the website or being there physically by our staff. Dentistsnearby.com shall be held liable for any disparity between the actual information of the clinic and on Dentistsnearby.com. Copying, modifying, transmitting, displaying, distributing, performing, reproducing, licensing, publishing, creating derivative works from, transferring or selling any information, software, products and services contained on or forming part of this Website, or otherwise using such content of the Website for resale, redistribution or for any other commercial use whatsoever including but not limited to any other website, surveys, contests or pyramid schemes. Harvesting or otherwise collecting by any means any programme material or information (including without limitation email address or details of other users) from the Website or monitoring, mirroring or copying any content of the Website without the prior written consent of dentistsnearby.com. The pages contained in this Website may contain technical inaccuracies and typographical errors. The information on this Website may be updated from time to time but we do not accept any responsibility for keeping the information in these pages up-to-date, nor any liability for any failure to do so. The website is available to all users "as is" and, to the greatest extent permitted by applicable law, the website is made available without any representations or warranties of any kind, either express or implied. dentistsnearby.com makes no representations, warranties or undertakings about the services or materials available on the website, including without limitation, their merchantability, quality or fitness for a particular purpose. All information provided on the website is intended as a guide only and should not be construed as a substitute for professional Medical/Dental advice and dentistsnearby.com makes no representations, warranties or undertakings as to the accuracy of any information provided on this website. dentistsnearby.com makes no representations, warranties or undertakings that the website, or the server that makes it available, will be free from defects, including, but not limited to viruses or other harmful elements. To the maximum extent permitted by applicable law, dentistsnearby.com accepts no liability for any infection by computer virus, bug, tampering, unauthorised access, intervention, alteration or use, fraud, theft, technical failure, error, omission, interruption, deletion, defect, delay, or any event or occurrence beyond the control of dentistsnearby.com, which corrupts or affects the administration, security, fairness and the integrity or proper conduct of any aspect of the Website. All use by you of the Website is at your own risk. You assume complete responsibility for, and all risk of loss resulting from, your downloading or using of, or referring to or relying on the facilities, services, materials or products provided on the Website, or any other information obtained from your use of the Website. You agree that, to the maximum extent permitted by applicable law, dentistsnearby.com and providers of telecommunications and network services to dentistsnearby.com will not be liable for damages arising out of your use or your inability to use the Website, and you hereby waive any and all claims with respect thereto, whether based on contract, tort or other grounds. No advice or information, whether oral or written, obtained by you from dentistsnearby.com shall be deemed to alter this disclaimer of warranty, or to create any warranty. To the fullest extent permitted by applicable law, dentistsnearby.com assumes no responsibility nor do we grant any warranties, express or implied relating to the operation, safety, condition or service of the Healthcare Professional or any doctor or any other person associated with the Healthcare Provider that is used by, for or on behalf of, you. dentistsnearby.com is not liable for the acts, errors, omissions, representations, warranties, breaches or negligences of any Healthcare Provider or any doctor or any other persons associated with the Healthcare Provider or for losses, damages or expenses resulting therefrom. To the fullest extent permitted by applicable law, neither dentistsnearby.com nor any of its officers, directors, employees, affiliates or other representatives will be liable for loss or damages arising out of or in connection with your use of any facilities, services and the website services offered or transactions entered into through or from this Website, including, for the avoidance of doubt, your transactions with healthcare providers or Medical/Dental services facilitated through this website, including, but not limited to, direct, indirect or consequential losses or damages, loss of data, loss of income, profit or opportunity, loss of, or damage to, property and claims of third parties, even if dentistsnearby.com has been advised of the possibility of such loss or damages, or such loss or damages were reasonably foreseeable. In no event shall dentistsnearby.com nor any of its officers, directors, employees, affiliates or other representatives be liable for any damages whatsoever resulting from the statements or conduct of any Healthcare Provider or third party or the interruption, suspension or termination of the website services, whether such interruption, suspension or termination was justified or not, negligent or intentional, inadvertent or advertent. Without limiting the foregoing, under no circumstances shall dentistsnearby.com nor any of its officers, directors, employees, affiliates or other representatives be held liable for any delay or failure in performance of the website or the website services resulting directly or indirectly from acts of nature, forces or causes beyond its reasonable control, including, without limitation, internet failure, computer equipment failures, telecommunication failures, other equipment failures, electrical power failures, strikes, lay-way disputes, riots, interactions, civil disturbances, shortages of labour or materials, fires, floods, storms, explosions, acts of god, war, governmental actions, orders of domestic or foreign courts or tribunals or non-performance of third parties. dentistsnearby.com does not exclude liability for death or personal injury, caused by its negligence or that of its employees or authorised representatives, or for fraud. This Website contains links to third party websites. Your use of third party websites is subject to the terms and conditions of use contained within each of those websites. Access to any other website through this Website is at your own risk. dentistsnearby.com is not responsible for, nor liable for, the accuracy of any information, data, opinions, statements made on third party websites or the security of any link or communication with those websites. dentistsnearby.com reserves the right to terminate a link to a third party website at any time. The fact that dentistsnearby.com provides a link to a third party website does not mean that dentistsnearby.com endorses, authorises or sponsors that website, nor does it mean that dentistsnearby.com is affiliated with the third party websites, owners or sponsors. dentistsnearby.com provides these links merely as a convenience for those who use this Website. Although dentistsnearby.com tries to make sure that the Website is available at all times, there may be occasions when access to the Website may be interrupted, e.g. to allow maintenance, upgrades and emergency repairs to take place, or due to failure of telecommunications links and equipment that are beyond our control. You agree that dentistsnearby.com shall not be liable to you for any loss incurred by you resulting from the modification, suspension or discontinuance of the Website. You have sole responsibility for adequate protection and back-up of any content and data you submit to the Website and for undertaking reasonable and appropriate precautions to scan for computer viruses or other destructive items. This Website is controlled and operated by dentistsnearby.com from Malaysia. dentistsnearby.com does not make any representation that the facilities, services, including the website service, and/or materials offered through this Website are appropriate or suitable for use in countries other than Malaysia, or that they comply with any legal or regulatory requirements in any other countries. In accessing this Website, you do so at your own risk and on your own initiative, and are responsible for compliance with local laws, to the extent any local laws are applicable. If it is prohibited to make this Website, facilities, services, including the website service, and/or materials offered through this Website or any part of them available in your country, or to you, whether by reason of nationality, residence or otherwise, this website, the facilities, services and/or materials offered through this website or any part of them are not directed at you. 1- Reach Over 1300+ Unique Patients Daily. 2- We Are A Homegrown Dental Directory Team, Proudly Made In Malaysia. 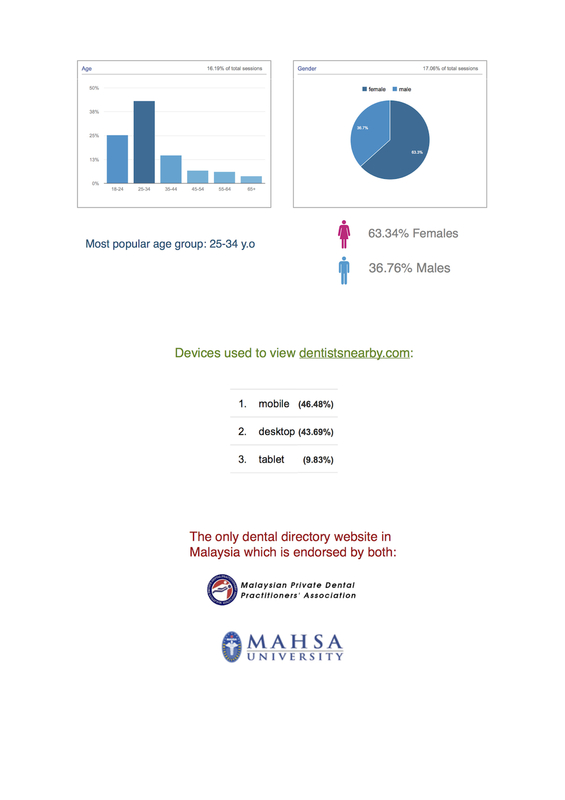 3- We Are The Only Dental Directory Officially Endorsed By Both The Malaysian Private Dental Practitioners' Association (MPDPA) & Mahsa University. 4- The Most Affordable Way In Town To Reach Health Conscious Malaysians Who Matters To You. 5- Collaborating With Amedix Sdn Bhd, One Of The Premier Dental Supply Company In Malaysia, Operating Since 1990. Created by professionals for professionals. By choosing to feature with us, you will be able to add in additional information on your individual "mini-website" within dentistsnearby..
And to top it all, we will also spread the word through our facebook page (fb.com/dnearby). Only RM 5 per day! We appreciate for long term relationship. Quick! Email us for special price. Banner space (1550x416px) - eye catching, flexible page redirection to any page. Featured space (300x80px) - we can design the logo too if you want. 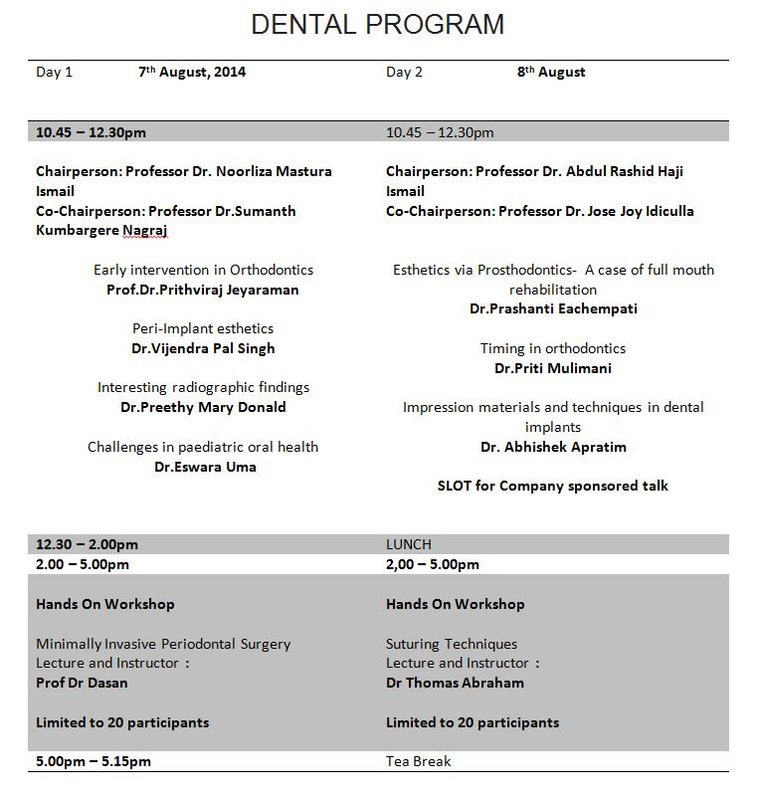 Dental Announcements space (300x200px) - we will throw in a page free of charge to convey your message. If your brand or practice is important to you, drop us an email anytime to inquire about how we can help you grow your brand.